A little over a year and a half ago, Anne-Sophie Pelletier, 42, was a medical assistant and union activist, leading a grueling strike at a retirement home in the foothills of the Jura Mountains of eastern France. Now she’s running for the European Parliament. Pelletier is part of a new crop of candidates for European Parliament backed by La France Insoumise (LFI), or France Unbowed, the still-young left-wing populist party that has emerged as one of the chief opponents of President Macron. Les Insoumis, as they’re often known, have remained a thorn in the side of the government, challenging it on everything from anti-union labor reform and tax cuts for the rich to environmental policy and police violence. At the same time, though, the party has struggled to transform broad public discontent with the president—whose approval ratings hover around 30 percent—into support for its own agenda. LFI hopes upcoming elections to the European Parliament are a chance to do just that—to break through in a political debate that often feels like a never-ending loop of the last presidential election: the ruthless neoliberalism of Emmanuel Macron, on one side; the toxic nationalism of Marine Le Pen, on the other. Just two months ahead of the vote, though, things aren’t looking so good. Polls regularly show La France Insoumise earning less than 10 percent support. According to one study published on March 25, the party has just 9 percent of the vote, well behind Macron’s electoral alliance (22 percent), Marine Le Pen’s rebranded National Rally party (20 percent), and the right-wing Republicans (14 percent). While Macron is unpopular, so is just about every other political figure in France. The irony is that today’s political climate—one dominated by disgust and disinterest—isn’t all that different from the run-up to the 2017 presidential campaign. 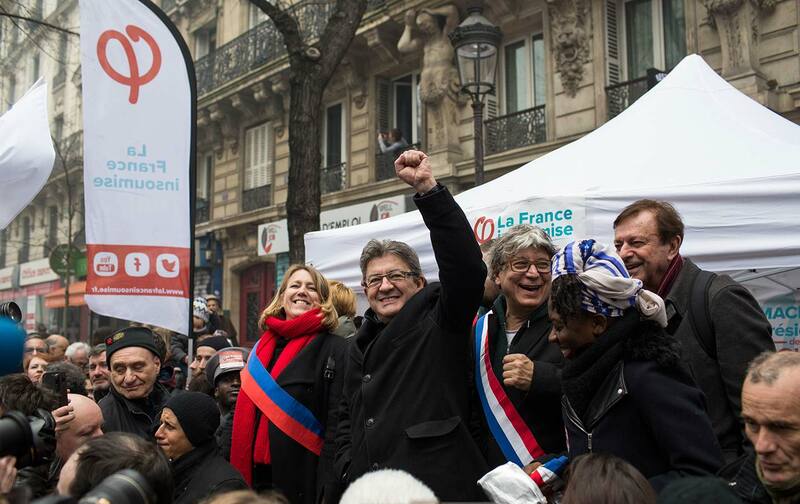 Back then, with deeply unpopular Socialist President François Hollande declining to seek a second term, Jean-Luc Mélenchon and his allies from the small Left Party decided to launch La France Insoumise. The idea was to focus on bread-and-butter economic issues and deploy a fiery kick-them-all-out message aimed at turning out disillusioned low-income voters. Inspired by the political philosopher Chantal Mouffe, the strategy involved abandoning explicit references to “the left” in favor of a populist campaign pitting “the people” against the “oligarchy.” And it seemed to work: Mélenchon earned nearly 20 percent of the vote and almost qualified for the election’s run-off phase, earning just 4 percent less than the current occupant of the Elysée Palace. Life in the opposition has proven far more challenging. Perhaps above all, because it’s hard to obtain victories. Macron’s La République en Marche (LREM) has a stranglehold on the National Assembly, allowing the president to essentially pursue his agenda at will, and with little regard for public opinion. Varying from the hotly contested to the downright unpopular, Macron’s reforms include changes to the labor code that make it easier for employers to fire and lay off workers, a sweeping reduction in the wealth tax, and an overhaul of the public rail system that lays the groundwork for private-sector competition. Other than hammer away in the press and join in street protests, there’s little La France Insoumise can do about it. Holding more than three-fifths of the Assembly’s seats, Macron’s parliamentary majority is, indeed, one of the largest in the history of France’s current Republic—greater even than the bloc aligned to Charles de Gaulle elected in the aftermath of May 1968. Only from 2002 to 2007 has the National Assembly been led by a larger absolute majority. And at that time, the president, Jacques Chirac, still regarded himself as something of a consensus-maker, in stark contrast to Macron’s views of the executive office. Still, Panot and her fellow Insoumis have made a difference in perhaps the one way they can: the framing of the debate. Mélenchon dubbed Macron “president of the rich” just days after his electoral triumph, and the label has stuck ever since. (According to one December 2018 poll, 77 percent of respondents agreed with that description of the head of state.) That’s due in no small part to the work of La France Insoumise deputies and activists, who have railed against Macron for serving the interests of the country’s economic elites. This sort of class-anchored critique would be laudable in its own right. But it’s all the more valuable today given the president’s other major source of opposition, on the far right. While Marine Le Pen’s party does pay lip service to the French welfare state, it prefers to keep the debate focused on questions of national identity and immigration. For better or worse, no other left-wing party in France has managed to level an economic critique of Macron with the same consistency and at the same scale as La France Insoumise. The New Anti-Capitalist Party plays a key role in protests, but remains condemned to the margins; the French Communist Party has been sidelined by internal power struggles; the Socialist Party (PS) has little credibility or moral authority after the previous presidential term; Benoit Hamon’s Génération.s, the French ally of Yanis Varoufakis’s European Spring movement, has sparked some interest among a subset of left-leaning white-collar professionals, but not much beyond that. Raphael Glucksmann’s Place Publique, or Public Square, has targeted a similar group of voters, but has proven to be little more than a vehicle for reviving the zombified PS, and is planning to run a joint list of candidates with the Socialists in May. While the party threw its weight behind ultimately unsuccessful protests against Macron’s labor and rail reforms, they’ve also lent a hand to the far more effective Yellow Vest movement. Kicked off last November over a proposed hike in the fuel tax, the grassroots protests have grown to encompass broader discontent with the rising cost of living and the president’s economic policies. La France Insoumise activists are present in dozens of local groups, adding manpower to rallies on traffic roundabouts and helping to shape demands. Meanwhile, Panot and her colleagues in the National Assembly have proposed legislation that would enact what’s emerged as the clearest demand of the gilets jaunes to date: the Citizens Referendum Initiative, or RIC. Under LFI’s bill, citizens would have the ability to propose referenda to pass laws, repeal unpopular ones, and revoke legislators. Many LFI supporters also share a deep-seated mistrust in the polls to begin with. They genuinely believe the party is doing better than what they reflect. While suspicions might be understandable over a poll or two, they fail to explain how dozens have shown similar results. Party activists also made the same charge ahead of the 2017 presidential election, but Mélenchon ultimately won just about what polls predicted. Lenny Benbara is the founder and editor-of-chief of Le Vent Se Lève, or “The Rising Wind,” an upstart independent online media outlet. It’s run by a team of young graduate students, writers, and activists, many of whom are sympathetic to the left-populist vision laid out by Chantal Mouffe. Benbara acknowledges that the press hasn’t exactly been friendly to LFI, but he says that’s not a sufficient explanation for its troubles. The last point has been especially visible in recent months, with several reports in the press raising questions about the party’s lack of internal democracy. Most importantly, La France Insoumise doesn’t have clear mechanisms for local activists to challenge the national platform or to join leadership. The latter has defended itself from such critiques by pointing to their method of selecting shares of delegates by lot—drawing the names of rank-and-file activists at random and naming them to party conferences and key committees. But one LFI activist appointed to the electoral committee in this fashion has said that party leadership strongly pushed their own list of candidates on unsuspecting delegates. Last November, the same committee moved to expel high-level figures François Cocq and Djordje Kuzmanovic from the list over political differences. The latter claimed they had been “purged.” To many, the episode only furthered the perception that a small clique close to Jean-Luc Mélenchon ultimately runs the show. Then, there are the infamous police raids. Last October, authorities showed up at the Paris headquarters of the movement as well as the apartments of key party figures, including Mélenchon himself. They were armed with warrants from a court investigating the potential overcharging of third-party vendors during the 2017 presidential campaign. Police raids are part of standard judicial operating procedure in France, but many LFI supporters maintain the ongoing probe against the party is politically motivated. LFI held an emergency rally the same day as the raids, condemning the police action and judicial investigation with rhetoric that struck many as over the top. One well-circulated video showed Mélenchon growing increasingly animated and furious as he tried to push through a door blocked by a court officer. “I am the Republic!” Mélenchon screamed at one point, a reference to his role as a legislator—but it was interpreted by many as the expression of an over-inflated ego. By the end of it all, the party’s reaction to the raids had clearly overshadowed the raids themselves. Karin Fischer is bothered by another image associated with La France Insoumise: the notion that the party is anti-European. It’s a common refrain from Macron supporters—but also among some on the left, like David Adler, a Nation contributor and policy coordinator for the European Spring movement, who has criticized LFI for being “nationalist.” A professor of British and Irish studies at the University of Orléans, Fischer is running for the European Parliament with LFI and is proud of her European identity. She’s half-Irish, her husband is Irish, and her children hold dual French-Irish citizenship. At the heart of that plan and the party’s European platform: overhauling EU treaties that would block La France Insoumise from carrying out its domestic agenda. If it were ever to come to power in France, the party would almost certainly come into conflict with the EU’s fiscal rules. These require member states to maintain budget deficit–to-GDP ratios of 3 percent and national debt–to-GDP ratios of 60 percent. If the push to reform those rules and others like them doesn’t gain traction, LFI has said, it’s prepared to abandon the treaties and even leave the European Union itself. It’s known as the “Plan A/Plan B” strategy, built on the idea that negotiations won’t work without driving a hard bargain. Fischer proudly points to the party’s detailed European platform as evidence that it takes the EU seriously, especially compared to its competitors. As of late March, no other major party had published a European-election platform. Even Macron’s La République en Marche released its list of candidates only this week. Still, there is evidence that LFI’s confrontational line on Europe has sounded grating to some left-leaning voters. Polls have shown the party just barely ahead of Europe Ecology–The Greens, a party that doesn’t even have a single member in the National Assembly and had all but disappeared from the national spotlight until a few weeks ago. “It’s a brand rather than a political party,” as one Insoumis activist in Arcueil put it. That may be so—but it’s one with appeal, including among some Mélenchon voters from 2017, as polls show. While the party’s platform remains shrouded in mystery, the Greens can proudly point to their longstanding support for the European Union. They might also be drawing sympathy from voters upset at La France Insoumise for not leveling enough criticism at the government’s hard-line immigration policy. Either way, pouring rain in Orléans has put a damper on LFI’s campaign event, leaving Fischer and fellow activists to talk among themselves and hand out flyers to just a handful of passers-by. It’s unclear if the meet-and-greet would’ve fared much better under the sun, though. Polls currently project turnout of just 40 percent for the European elections. Participation has hovered around that level for the past three such votes in France, about half of recent turnout levels for presidential elections. Mathilde Panot is optimistic, though. She remains confident in the party’s strategy of targeting the disillusioned, the angry, and those unlikely to vote—in other words, most of France.